Plato Crater, the second instalment in Carleton Chinner’s “Cities of the Moon” trilogy, continues the journey of the now independent Moon Folk as they seek to renegotiate their relationship with their former masters on Earth. At its heart, though, this story is an examination of identity and what it means to be human. The story opens with Jonah, the hero of the first book of the series, The Hills of Mare Imbrium, returning to Earth on a mission to negotiate a new trade deal with Earth. Throughout this early section, the book switches rapidly between different settings, examining the impacts of a Moon-initiated embargo on both Earth- and Moon-based communities. Jonah, a former inhabitant of Earth himself, is confronted with the constant tension of his role as a negotiator for the Moon while his own people are suffering the ill effects of this embargo. Meanwhile, Empress Yesha, another major character from the first book, deals with dissatisfaction from the Moon Folk, who are also suffering from the loss of a profitable trade relationship. Rather than settle into a largely political drama, however, Chinner’s tale quickly returns its focus to developments on the Moon. Plato Crater’s story traces parallel developments, as the communities from the first book face a new challenge in the form of a newly planted colony in Plato Crater. The tension created by this new presence on the Moon, along with the divisions that remain unresolved between the different groups introduced in the first novel, drive the remainder of the story. Although a sequel, Plato Crater would be accessible to readers who have not read the first book. It relies on places having to do with earlier plot developments but generally provides enough hints that a new reader should be able to identify the overall pattern, even if certain details are lost. By introducing a range of new settings and new characters, Chinner showcases what was consistently one of his best talents in the first book—his descriptive ability and imagination. Each setting, particularly the lunar settings, are imaginatively drawn, deeply developed, and well described. 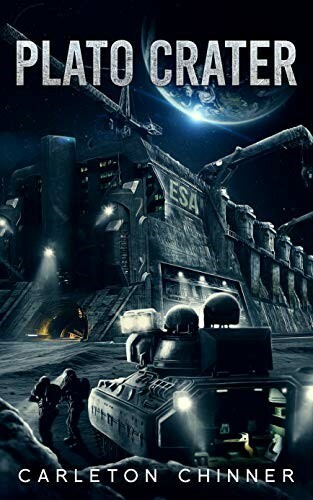 The detailed explanations of how a new lunar colony is built from its initial stages were especially well presented, containing a great deal of thought and innovation, while still staying fast paced enough to keep the reader’s attention throughout. Unlike the first book, these innovations do not become overwhelming or feel like a simple shopping list of new technologies—instead, the newly introduced inventions all contribute to the narrative and help drive a story that is both more immersive and better structured overall. As the story develops, one feature becomes particularly important: The existence of merged human and software brains. The invention, which was featured briefly in the first book, is explored in some detail from several perspectives and introduces an interesting thought experiment to the book. It invites readers to consider the concept of identity and to try and engage with the limits of human personality—more than one character acts under the influence of multiple forces, and, so, both the complexity of the characterisation and the morality of their actions are drawn into question. It’s an idea worth examining and one that the author handles well. Another improvement in the author’s storytelling can be seen in one of the new character arcs in the book: Holly. A young Earth-born runaway who ends up as one of the founding members of the new Moon Colony, Holly’s story provides an independent plotline alongside that of the main characters, which adds depth and colour not as identifiable in the first book. While there are occasional missteps, her characterisation is more careful and convincing than others, showing a real improvement in Chinner’s craft. While these improvements place Plato Crater a step above its predecessor, it is still defined by sharp changes in plot direction that confuse the reader and leave some characters seeming wooden or inconsistent. At several key moments in the book, a character will make a decision that seems completely at odds with the way they have acted previously or to their stated motivations. Jonah spends weeks doing nothing to progress trade discussions and then meets with the Senate after only a few days of trying. Other plot developments are similarly sudden in their changes in direction. These rapid shifts give the impression that the characters are passengers in their own story arcs rather than the driving figures. As a result, a lot of the careful work done by the author in expanding and giving them relatable emotions is lost when their actions betray these apparent intentions. Plato Crater is a step forward for a developing author and delivers on more of the promise suggested by The Hills of Mare Imbrium. However, while in places it is engaging and insightful, the limitations of its characters, and the artificiality that pervades key moments in the plot, limit the enjoyment. Both the plot and the author have real potential, but neither has made a wholly successful landing in this instalment.